10 August. Chu Teh, CCP commander in the north, announces that Japanese soldiers may surrender to any anti-Japanese armed forces (including the CCP). Next day, CCP leader Lin Piao begins force-marching a large army along the Peiping–Mukden Railway into Manchuria ahead of Chinese government forces. 14 August. Chiang Kai-shek sends the first of three cables wired to Mao Tse-tung over a 10-day period, inviting him to talks in Chungking. In response, Mao insists that CCP forces should also accept the surrender of Japanese troops and the Party should play a leading role in a future coalition government. Mao says that he sees little point in formal negotiations if Chiang cannot take these two positions into serious consideration. 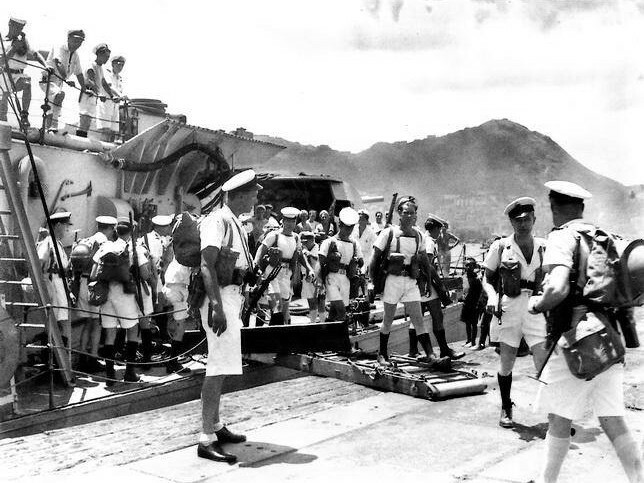 British troops arriving in Hong Kong. This is the first of a six-part ** ‘Special Edition’ ** that presents all China material in a single location. Click for Part II, Part III, Part IV, Part V, Part VI The following expert analyses are related (sometimes indirectly) to the situation in China: Li Lin, Road to the second KMT-CCP civil war. Kwong Chi Man, Liberating Hong Kong. Geoffrey Gunn, Macao and the British reoccupation of Hong Kong. Bruce A. Elleman, Sino-Soviet friendship and Outer Mongolia. Uradyn E. Bulag, ‘Uninvited’ war and the Mongol trophy. Li Lin, The Takeover of Shanghai. David Askew, Surrender in Nanking. George Kulstad, A boy in wartime Shanghai. Huang Chih-huei, Taiwan and the establishment of Chinese rule. Bruce A. Elleman, Soviet sea denial in Port Arthur and Dairen. Geoffrey Gunn, The fate of European treaty ports. 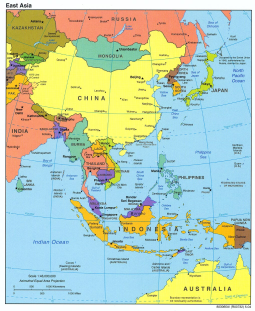 Bruce Reynolds, Thai-Chinese relations under pressure. David Marr, The Chinese army enters Indochina. 14 August. In return for Soviet pledges of moral support and military aid given solely to the KMT regime as the central government of China, plus undertakings on Chinese sovereignty and territorial integrity, Chinese envoys reluctantly sign a Treaty of Friendship and Alliance in Moscow. This grants the Soviets effective control of Dairen and Port Arthur along with extensive concessions in Manchuria. China also undertakes to recognize the independence of Outer Mongolia in its existing boundaries (i.e. Inner Mongolia is to remain part of China), subject to a positive referendum result. 10 August. With Japanese forces in Manchuria reeling before the Soviet onslaught and MPR troops advancing in Inner Mongolia, Stalin personally warns the Chinese government to sign a friendship treaty before it is too late. Negotiations have been stalled for months, with China resisting Soviet demands for extensive concessions in Manchuria and recognition of Outer Mongolian independence. 10 August. Looking to thwart Chinese aims to occupy the Crown Colony and return it to Chinese rule, the British cabinet agrees to send a British fleet to Hong Kong. Pro-British (Chinese-Macanese) agents also send an order to Franklin Gimson, the Coloni al Secretary for Hong Kong, to formally re-establish British colonial rule. Gimson is still being interned by the Japanese in Hong Kong. 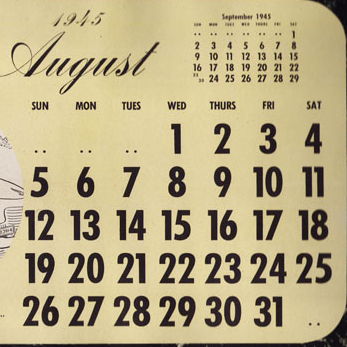 15 August. Long before Shanghai is liberated, thousands of British, Dutch and American internees are freed in the city. Next day, an OSS operation begins to liberate Allied POWs in northern China. This succeeds within a few days but a similar operation in Korea ends in failure.